by Lara Anisman. Published on 28 March 2019. It is not uncommon for a juicy piece of mathematics to crop up in a seemingly unexpected place — such as in the building blocks of multicellular life: epithelial cells. In June 2018 it was in the realms of cellular biology that a new geometric solid, previously unknown to mathematicians, was discovered. Behold, the scutoid! In order to visualise a scutoid, imagine two parallel pentagons which define a columnar surface by drawing lines between the matching vertices of the two pentagons. Then, if we take one of the edges created by this connecting of points – and “unzip” it to halfway along the line, thereby turning one of the pentagons into a hexagon, with the creation of a triangular face along the half-zipped edge, we’ve created a scutoid. Where did the scutoid come from? This might not be so clear at first, so we’ll take a look at how the scutoid was discovered. An international team of scientists, led by researchers at the University of Seville in Spain, made the discovery whilst using computer modelling to study the 3-dimensional packing of epithelial cells. Epithelial cells are fundamental to the structure of multi-cellular organisms. They range from columnar to cubic in shape, and complex reshaping and restructuring of epithelial cells is necessary to create spherical or ellipsoidal structures from layers of planar epithelial cells, in order to build tissues and organs. It is in this setting that the scutoid has arisen; scutoids appear in tubular epithelia. Epithelial cells line the outer surfaces of organs and tissues. They can arrange themselves into many different shapes. Image: OpenStax college, CC BY 3.0. In modelling the growth of epithelial tubes, the team of scientists assumed that the surfaces of epithelial sheets are constructed by Voronoi diagrams. So what are these? Consider a set of “seed” points randomly placed on a surface in three-dimensional space. 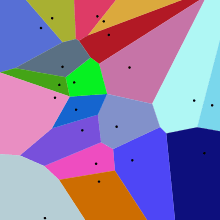 A Voronoi cell is then defined by the set of points around any given seed which is closer in distance to that seed than to any other, and a Voronoi diagram shows all of the Voronoi cells for a given choice of seeds. A Voronoi diagram is also called a Voronoi tessellation. The applications of Voronoi tessellations range from engineering to informatics to medicine, and are most notably useful in modelling the structure of biological tissues, such as in the case of epithelial cells. Let’s now suppose that our epithelia are arranged in a tube. What does their Voronoi diagram look like? Imagine covering the inner surface of the tube with seed points at random. We can then tessellate the surface to produce the corresponding Voronoi diagram. Next, lets consider the outer surface of the epithelial tube. Imagine that we have chosen our seeds by simply enlarging the inner surface so that it now has a larger radius, keeping the original seed points in the same positions, but pushed further apart in every direction because of the increased radius. We discover that, upon drawing the Voronoi diagram for the outer surface, the two tessellations do not match each other! Had we simply stretched the surface of a totally flat (zero curvature) Voronoi diagram, we would find that the tessellation matched. The difference in the case of the epithelial tube lies in the non-zero curvature of the cylinder. Upon the enlargement of the surface, regions around the seed points change because you could think of “more” surface being injected into the intervening regions around points, as a result of the curvature (see below left: notice how the blue and yellow cells only touch on the inner cylinder). A similar visualisation analogy is used in cosmology to describe the expansion of the universe. Consider covering the surface of a balloon in dots with a marker pen. As you blow the balloon larger and larger, every point moves further from every other point, as the distance between all points increases (above right). As the Voronoi cells transition around a given generating point from the inner surface to the outer, the geometric shape of a scutoid is drawn out between the two layers! Scutoids display concave surfaces which allow for the arrangement of cells in curved tissue. On top of that, the boundaries between the given cells follow geodesic trajectories. This makes the packing of epithelial cells in curved tissue “energetically efficient”. The discovery of such novel mathematics present in nature could be particularly useful in providing engineers with modelling ideas for the construction of human-made tissues by providing a ‘scaffold’ for the tissue to grow on. And if you’re wondering about the name? Well, there’s two answers. 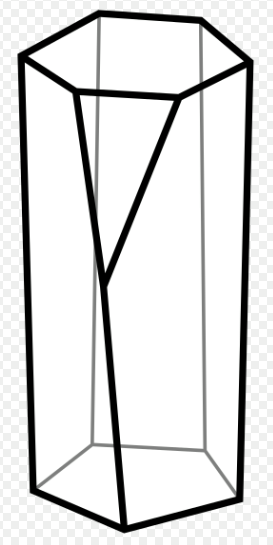 One is that the scutoid looks a lot like the back-end of a beetle, technically called a scutum. The other explanation is that the study’s group leader is called Luis M. Escudero, and the name plays off that. Either way it seems that from beetles to brains, scutoids are everywhere! You can read about the fantastic science that led to the discovery of the scutoid in this paper, which is open access! Stories and lessons on diversity in mathematics from a globe-trotting number theorist. Mathematics: queen of the arts? Exploring the connection between maths and art. ← Read Issue 09 now! Moonlighting agony uncle Professor Dirichlet answers your personal problems.